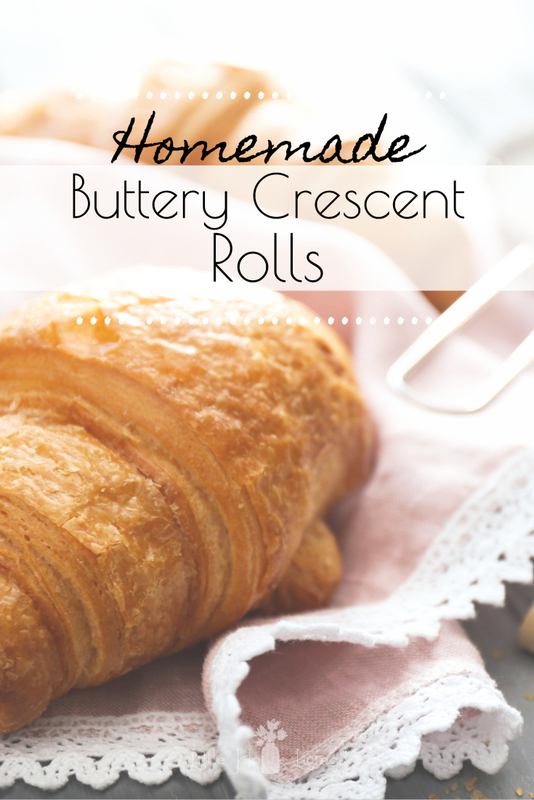 Have you ever dreamed about making your own homemade buttery crescents for your family to enjoy with breakfast or supper? It’s much easier than you think! I’ve been craving a nice light fluffy crescent. It would be so easy to just buy the little tube at the store and plop them in the oven but have you looked at what’s in those things? Scary! 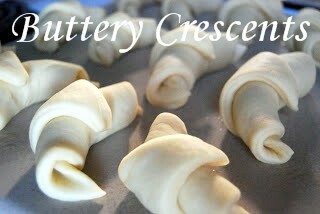 So here is a yummy easy recipe for buttery crescents. Enjoy! Mix together the yeast, the warm water, and 1 t. sugar. Let it sit for 5 minutes. Mix together all the other ingredients besides 2 cups flour. Add in the yeast mixture and stir well. It will be a very soupy dough. Add the last 2 cups of flour and knead. If you are kneading by hand, knead for about 6-8 minutes, if you are kneading in a mixer, knead for 4-5 minutes. Then put the dough in a warm place and cover and let rise for 1 hour. When the dough is done, break it into 2 halves and roll each half into a circle. Make it about a big as a pizza. Cut it into 12 pieces, just like a pizza! I even used the pizza cutter to make the slices. Roll up each piece from the big end to the little end. Place on a greased cookie sheet. Bake at 350F for about 11 minutes or until lightly browned. After they come out of the oven you can spread a little butter on top each of them. Yummy! Mix together all the other ingredients besides 2 cups flour. Add in the yeast mixture and stir well. It will be a very soupy dough. Add the last 2 cups of flour and knead. If you are kneading by hand, knead for about 6-8 minutes, if you are kneading in a mixer, knead for 4-5 minutes. Then put the dough in a warm place and cover and let rise for 1 hour. Bake at 350F for about 11 minutes or until lightly browned. Want to make these Homemade Crescent Rolls an entire meal? Try these Cheesy Chicken Crescents freezer meal. Simple and delicious! 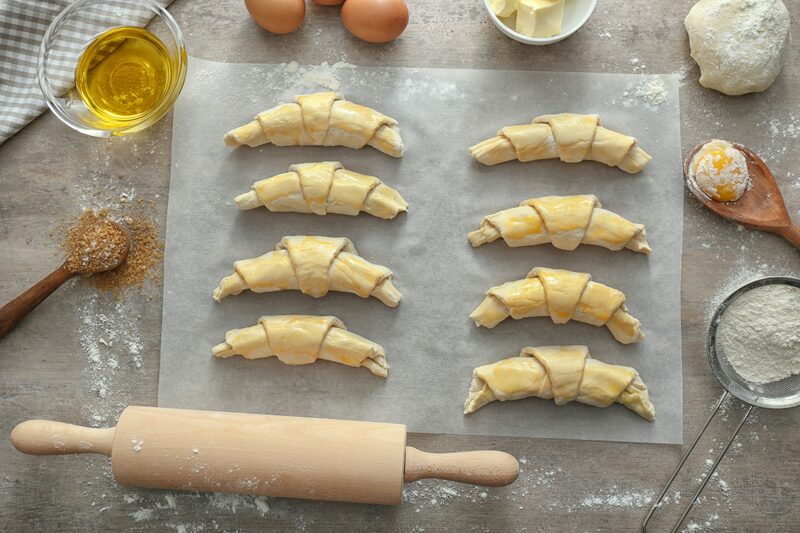 Have you ever made your own homemade Buttery Crescents? What did you serve them with? 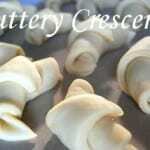 This recipe for Homemade Buttery Crescents was originally published on Little House Living in December 2010. It has been updated as of April 2019. I made these last night, oh so YUMMY. We love them. Thank you for the GREAT recipe. These look great (especially with the cheesy chicken). 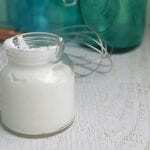 Can you substitute the white flour with whole wheat flour? Also, do you have a whole wheat flour BREAD recipe that is good? I hate buying bread at the store and it be filled with so many questionable ingredients, but every recipe I try comes out bad. Okay these sound amazing, quick question though: it says 1/2butter would that be tsp, TBSP cup? Sorry should be obvious but I have never done much baking, and am trying to do a baking day! 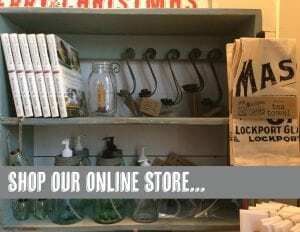 I think I have spent most of the day on and off going through your amazing blog! Thanks so much. It says a half cup of butter now which is a whole stick. I hope that was right, because I just finished and put my dough out to rise now… Also, it says to put the rising dough in a “water place” does that mean a “warm” place? Thanks a bunch. Glad I found your blog. It is very appealing. These are the best! I’ve been making them since the first time you posted the recipe! I was wondering if you could freeze these. If you could would I bake them then freeze them? Yes, I would bake and then freeze. I’m sure they would be just fine! I tried to post this as a link on my Facebook page and it keeps telling me I can’t because of some privacy setting. Is this a mistake, and how can I fix it? I wasn’t stealing the recipe, but linking back to your page with the original. Help! Hmm, I have no idea. Everything should be set up to share here, maybe something in your Facebook profile doesn’t allow you to share links? I’m not sure, Facebook changes too often! These came out amazing!!! I used a whole stick of butter and I let them rise a little more after I made them into crescents. OH SO GOOD!!! Thank you! Can you do these with gluten free flour? I haven’t tried it yet but if you do let us know how it goes. Wow! This will be a go-to recipe from here on! I am done with “the tube” kind! I really impressed the family tonight, the rolls tasted as good as they looked. Thanks! Hi I’d like to make these in the bread machine. 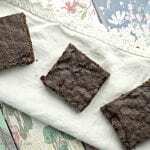 Have you ever made these in the bread Machine? I am wondering about the need to reduce liquid or flour. And I’m assuming it would use the regular dough feature. Thanks for this great recipe. 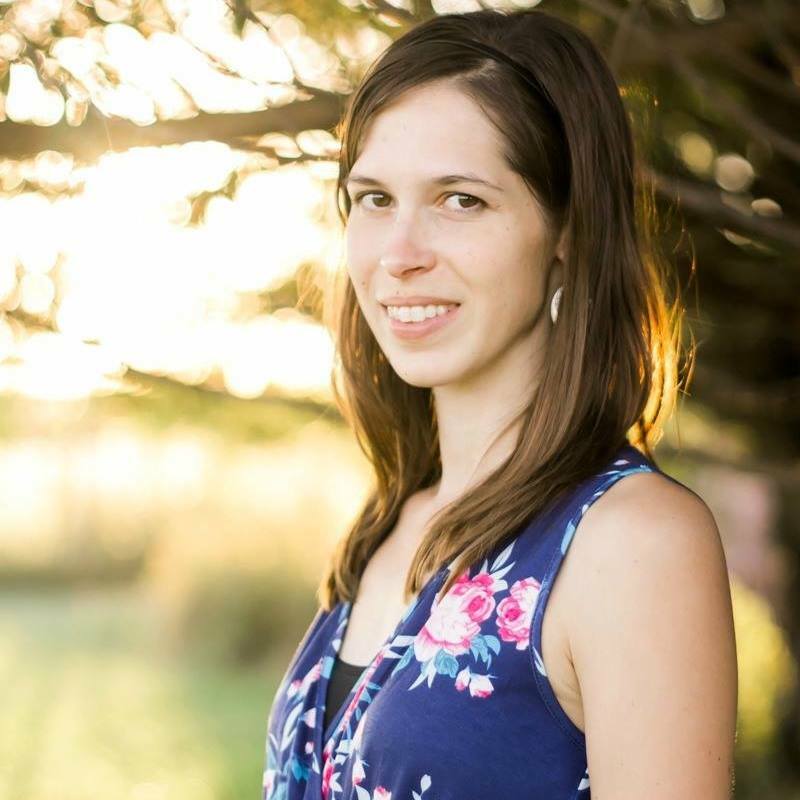 Recently found your blog and I’m loving it. I haven’t tried these in the bread machine so I’m not totally sure. I think I would try the recipe as is and if it seems like it’s too dry when the bread machine is kneading you could add in a bit of extra water. Have you made these gluten free? if so what did you do to substitute? I have not tried this recipe gluten free yet.